If you have compassion for everyone but, say, a certain ethnic group or animals, then you are killing part of your empathic resonance with others. You end up dehumanizing a group of human beings or removing animals, say, from the sphere of your consideration. What we as Unitarian Universalists believe to be true is encompassed in our Seven Principles, reflecting our understanding of how to relate to each other and to the natural world around us. Unitarian Universalists live their lives in a free and responsible search for truth and meaning. Since our understanding is evolving, our Principles too must evolve. They were really never intended to be static and in fact, the process for change is well established in our denominational governance – requiring a review of the Principles every 15 years and providing detailed procedures for amendment. The last such process occurred in the early 1980s culminating in the creation of our Seventh Principle – to affirm and promote respect for the interdependent web of all existence of which we are a part. Seven Principles of Unitarian Universalism. Design by Ian W. Riddell; graphical interpretation by Kimberley Debus. Sunset in an African rain forest. A chimpanzee arrives on the scene, carrying a papaya against his loins as he walks along. This is his bedside snack. The chimp puts down the papaya. For a full 15 minutes the animal remains as if spellbound by the spectacle of the changing colors of the dusk, and watches without moving. Then he withdraws silently into the thicket, forgetting his papaya. The process of change. Over time I’d hoped there would be enough support among Unitarian Universalists to bring about a change in the First Principle to reflect our evolving understanding of nonhumans, and am happy to say that the process for this has begun! Unitarian Universalism’s umbrella organization, the UUA, holds annual “General Assembly” meetings in the summer. At this year’s meeting, delegates will vote on a one to two year study action to amend the First Principle. We’ll have an opportunity at UUCC to have a conversation about this in the next few weeks. If you live in the DC/Md/Va area, we’d love your participation. In the mean time, you can reflect on this First Principle change initiative in the comment space below this post. Some final thoughts: Many of us have experienced the joy and heartbreak of sharing our lives with nonhuman animals. We’ve welcomed furry or not so furry companions into our families. We’ve had encounters with creatures in the wild, up close or from a distance, some incredibly beautiful and magical and some scary. We’ve observed farmed animals in the peaceful, natural settings of a field and also in the dark, unnatural settings of a factory farm. We’ve known from our experiences that these “others” are indeed conscious, aware – sentient – beings. They suffer pain, fear death and mourn loss. They experience joy and love – not unlike our human experiences. How can they not have inherent worth and dignity? Ross, W.R. (2006). 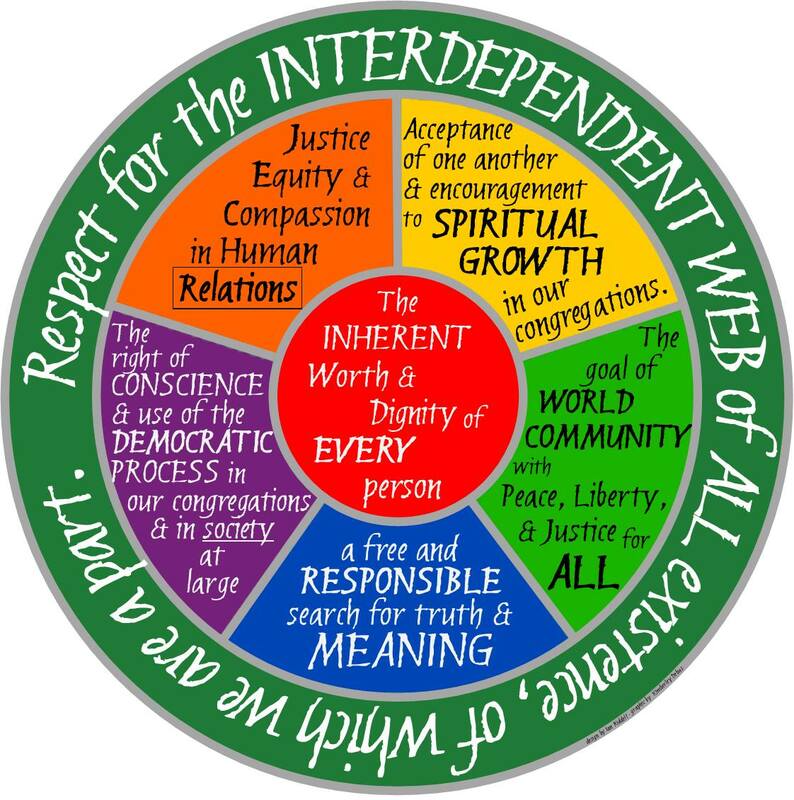 Shared values: How the UUA’s Principles and Purposes were shaped and how they’ve shaped Unitarian Universalism, UU World (online, http://uuworld.org/articles/how-uu-principles-purposes-were-adopted, reprinted from a 2000 article); Skinner, D.E. (2006), Time to review the Principles: UUA commission, trustees announce review of central covenant between congregations; mandated review is overdue, UU World (online, http://www.uuworld.org/articles/reexamination-uua-principles-announced). Facilitated by a UU minister, Rev. Dr. LoraKim Joyner who has been central to the reconsideration of the language of this principle, we will be able to ponder our feelings and thoughts about whether affirmation of inherent worth and dignity should extend to our non-human family.